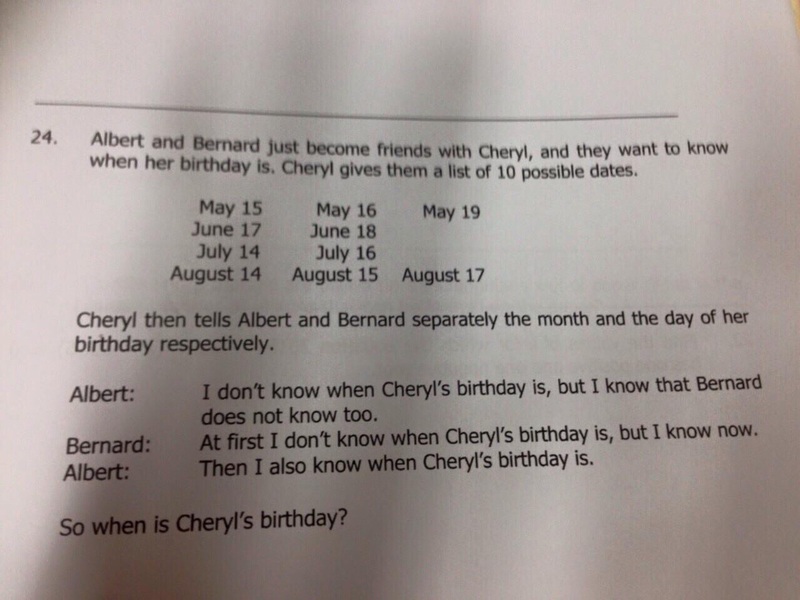 You know the American game show ‘Are You Smarter Than a 5th Grader?’ If we’d ever like to create our own local spinoff, this Primary 5 logic question would make for an interesting test. Solved it yet? While not complicated, the question does seem rather high-level even from an adult standpoint. Most debates online have turned up two answers with different explanations: July 16, and August 17. There seems to be more of us leaning towards the July 16 answer, and this webpage even has a helpful step-by-step discussion of why we should be careful of making false conclusions when dealing with questions of this sort. Personally, I think the answer is July 16: the problem with the August 17 solution is that it assumes only May 19 and June 18 aren’t possible. 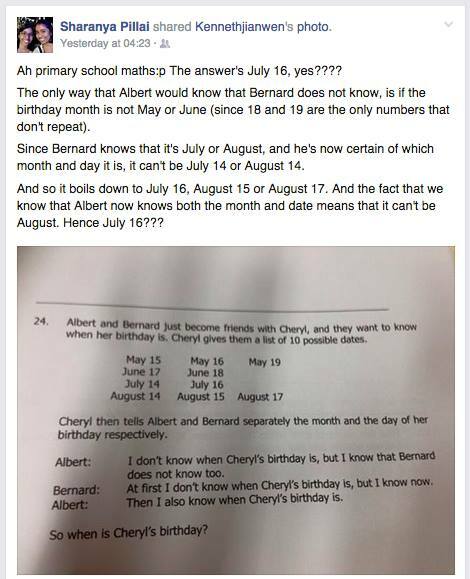 Albert could only have ruled out these unique dates by knowing that the month was either July and August, which don’t have unique dates. So the entirety of the June and May dates can’t qualify as possible solutions, which rules out the elimination of repeated numbers seen in Steps 5-6 in the second solution…and well, you get the idea. So did the question stump you for a while? Don’t worry, you’re not alone — hats off to those eleven-year-olds who supposedly had to do this question. Maybe it’s just me getting old, but solving that took quite a bit of mental gymnastics.